This post is a little different from my usual Fangirl Thursday ones, but sometimes you just have to go where the inspiration leads. I love clothes. I love to shop for them, to look at them in magazines and on red carpets, and to talk about them. As such, dissecting a character’s costume choices is one of my favorite ways to analyze any piece of media. From the evolution of Kate Beckett’s hair to the bright colors worn by Mindy Lahiri, the outward appearance of a TV character gives us a lot of insight into exactly who they are. Therefore, when a character shows up wearing something different from what we’ve come to expect, it’s important. It’s worth talking about. This—Emma Swan in a soft pink dress with her hair pulled back, ready for her first real date with Hook—is worth talking about. We’ve never seen Emma wear anything like this before, and that’s perfect. Because we’ve never seen Emma feel like this before. The two most memorable instances of Emma wearing a dress were on “dates” in the pilot and in Season Three’s “New York City Serenade.” In both instances, Emma was dressing for work—in the pilot she was working a case and in “New York City Serenade,” she came to her date from work. (I watched that scene again to make sure, and she apologized for being late, prompting Walsh to assume she “caught the guy.”) And even if she went home to change before her date with Walsh, there’s another parallel to be found between that date and the one in the pilot: Emma wasn’t truly herself on either date. We have no idea how Emma Swan would really dress for a date because this is all new—for us as viewers and for Emma as a character. Emma Swan has always been a guarded character, and her clothes have reflected that. Her leather jackets and her dark-colored clothes are her armor. Even the initial pilot script described her in her dress as “a Terminator in couture.” Emma’s first instinct is to protect, and for a long time, that meant protecting herself by projecting a “tough” image to cover up the fact that she’s always felt like “a lost little girl who didn’t matter and didn’t think she ever would.” Emma feared showing anyone even a shred of vulnerability; she hardened herself in response to her hard life, leaving no room for clothes that would make her look “soft” to people that could hurt her. But this dress—with its delicate pink color and romantic style—is as soft as it gets. It’s a striking visual contrast to anything we’ve ever seen Emma wear before, and it’s supposed to be. This is Emma without her armor, putting it aside for at least one night with a man she’s come to trust with both her rough edges and her delicate heart. This is Emma embracing a quiet, happy moment where she can put aside her role as the savior and the sheriff and indulge in a little time to simply be Emma, a woman who is finally letting herself be loved for exactly who she is. The Emma wearing this dress and smiling at Hook is a direct reflection of the Emma we saw at the end of “Rocky Road.” She let the last of her emotional armor fall away in that episode, completely exposing the soft, vulnerable heart that she tried to harden after losing so much. And she did that because—as she explicitly told Hook—she trusts him. That trust allowed her to be completely vulnerable with him, to let the last bit of her guard down. So she can wear a soft pink dress in front of him and smile without reservation now—because she feels safe to be completely herself with him, and that means letting him see the softer side of her personality that she felt scared to reveal to anyone after being hurt in the past. Emma spent so long looking for a home, for a place where she could feel safe to be herself and loved for who she is. And now she has that. She has a mother who’s holding a camera as her daughter goes on a date and a father who looks protective and proud all at once. And she even has a friend who looks truly happy for her. This is a moment for Emma and Hook, but it’s a moment for her parents, too. They never got to watch their little princess go to a ball or get courted by a suitor. And Emma never had parents waiting up for her after a date or taking pictures before prom. There’s a sense of innocence to this moment, and that’s reflected in Emma’s dress, too. Emma grew up too fast; she never got to experience an innocent moment like this one, and I’m so happy that both she and her parents are able to have this. And that innocence comes into play for Hook, too. He must feel at least a little bit like the young lieutenant he once was, who might have dreamed of courting a princess before losing his brother and starting down a darker path. Because Emma is a princess, and in the Season Three finale we finally saw her embrace that part of herself. She danced at a ball with Hook, who called her “your highness,” and she seemed to truly enjoy living in a fairytale for at least that moment. This date is their chance to bring a little bit of the romance of that ball into Emma’s world. Her dress is ladylike because this is her chance to let herself feel like the princess she is. Once Upon a Time is Emma’s fairytale, and this date is her first real chance to have a fairytale moment in a world that felt like anything but a fairytale for too long. Emma’s life has been filled with so much loss, and she carries that loss with her in many ways. Physically, Neal’s swan keychain/necklace and Graham’s shoelace have been common parts of her wardrobe, but they’re absent for her date. She is trying to move beyond the pain those things represented, trusting that this chance at love doesn’t have to end up like it did with Neal and Graham. This is an Emma Swan trying to let go of the painful losses that made her so afraid to open her heart to Hook. In her pink dress with her hair off her face and her light makeup, she is the living embodiment of the idea of a fresh start. The Emma we see in this dress is a softer Emma than we’ve ever seen before, but she is by no means a weaker Emma. In fact, she’s stronger than she’s ever been. It takes an amazingly strong person to trust someone with the softest and most vulnerable parts of your heart after you’ve been hurt the way Emma has. It takes incredible bravery to let your guard down after a lifetime of having it up. Emma showed true courage when she fought dragons and witches, but she’s showing perhaps even more courage in this moment—trusting Hook with the softest parts of herself that she’s kept hidden out of fear of being hurt. Emma Swan is such a great character because she’s layered and multifaceted, like real women are. Yes, she wears jeans and leather, but she can also wear pink dresses, using both of those wardrobe choices to highlight different kinds of strength. Those two things don’t have to be mutually exclusive when you have a character with the depth we’ve seen in Emma. They simply reflect different facets of this multifaceted character. There are so many different ways that women (and people in general) can be strong. Once Upon a Time celebrates the idea that true strength doesn’t always show itself in wielding a sword or taking down a monster. It often shows itself in opening yourself up to someone when life has given you every reason to fear vulnerability, and that’s what this date and this dress are all about. The strongest people don’t always wear armor. Sometimes they wear pink dresses. This entry was posted in Fangirl Thursdays, Television and tagged essays, fangirl thursdays, nerd musings, once upon a time, television by Katie. Bookmark the permalink. I just love what you’ve written here. Thank you for this. You’ve made so many wonderful points and I’m so glad you took the time to address Emma’s change of wardrobe. I think she looks fantastic and can’t wait to see the episode and hopefully a happy couple. Thank you for the kind words! I’m sure that there will be plenty of drama and angst in the future, but I’m also looking forward to seeing this happy moment for two characters (and more if you include the Charmings and Elsa) who’ve earned this reason to smile. I knew there was a meaning to her choosing the dress and the colour esp the wardrobe department. Emma’s dress sense always has reflected where she is at and why. I very much look forward to this date and what it brings to my favorites Emma & Hook individually and together. We know in this show True Love having the connection and also means fighting, never giving up, finding them, choosing them, putting them first, risking your life for them, coming back to them….. this is what I have seen in Hook & Emma esp Hook doing that – go to the ends of the world and time for her. Thanks for the kind words and for sharing your enthusiasm with us! What you said about the importance of trust was spot-on, and it’s something that’s so important for Emma in all of the relationships she’s developing. Another great article. From previous interviews I’ve read on OUAT I’m pretty sure that Jennifer Morrison had a very big say in the dress she’s wearing – I remember hearing on some podcast that originally the dress Emma was wearing at the ball in 3.21 was meant to be pink but she asked for it to be changed to red. You can be sure a lot of thought went into that dress. I can’t wait to see this episode now! I totally agree—costumes are always treated with a lot of thought and the costumes for a scene like this were probably discussed for a long time by the costume department, Eddy, Adam, Colin, and JMo. I also get the impression that JMo cares a lot about what Emma’s clothes say about her, so I’m sure she had a huge say in Emma’s overall look for this scene. I love that you wrote about this. It’s like Emma’s outer self is now reflecting her inner self. She’s open and vulnerable and completely okay with that. It’s such a wonderful thing to see. In last season’s finale when she got to dress up like a princess and dance at the ball you could see the joy beaming on her face. It’s a side of her she’s always had but kept buried and hidden and now she’s embracing it. You posted the link to that article on Twitter where Jennifer and Colin were talking about her dress. And I love what Colin said about how it took a guy clothed in leather and with a hook to bring out the softer side of Emma. 🙂 I can’t wait to see more of it and am so excited about their date! On another note, I honestly can’t remember her wearing Graham’s shoelace. Does she wear it on her necklace and has she always been wearing it? She wears it tied around her wrist. I had never noticed it, but it’s a detail that comes up in a lot of fanfic and Jennifer has commented on it – I believe it was her idea to add that detail. As far as Graham’s shoelace goes, Emma wears it around her wrist. It’s a little detail that Jennifer Morrison pointed out, and I always thought it was a nice tribute to a relationship that certainly meant a lot to Emma. That’s such an interesting detail. Thanks for pointing it out. I wonder if Emma’s clothing will come up in the episode – if anyone will ask or if Emma will explain it in any way. I’m looking forward to seeing how this plays out. haha I’m looking forward to EVERYTHING about this episode and this show in general! I have so many feelings about this both because of fan reaction and because of the symbolism for this particular character and this moment in her journey. I am going to address the first just to purge myself of it from Emma on back to Kate’s wearing/not wearing of the ring and the silly that ensues as a result. One of my dearest friends in the world is a costume designer/wardrobe supervisor. The very notion or idea that clothing, costuming, props aren’t an integral part of character development and storytelling is a load of hogwash. It is an insult to my friend and all the folks in the industry who are behind wardrobe, hair and makeup. It is all deliberate, thoughtful and crafted to service the actor and all that goes into a production. I remember Luke Reichle talking about the wardrobes of Castle and Beckett and how color palettes were an extension of when the characters were in sync or on the outs with each other. I think people mistake what Eduardo Castro and his team on OUAT have done and achieved on this show. Certainly we have the grandiose styling that comes out of the Enchanted Forest but that isn’t where both the characterization and story telling stops. It extends and I would argue is even more important in Storybrooke because it takes pieces of the character’s they are in the EF and transfers it into the modern day reality. We all have symbols in our clothing and accessories to both enhance and hide the things we want the outside world to see. Thus the pink dress heard round the world. When it popped up in the trailer I wasn’t immediately drawn to the dress but the makeup and hair they’d given Emma. My immediate thought was flirty and whimsical. Which every girl wants to be on her first date. That high ponytail instantly reminded me of Kate Beckett (and truth be told, your penchant for ponytail envy). Because similarly over on Castle it was a stark shift in her character’s silhouette which has become less guarded over the seasons. Emma is no different and it isn’t just about her date with Hook, it is about finding a sense of place and feeling grounded to be transparent to who you are — all of who you are, not merely the carefully constructed pieces we all create for work, Saturday night out, vacations, etc. Having a sense to be all of who you are and be comfortable in that skin is the cornerstone of bravery. I think about it even through the lens of other characters in Storybrooke. When we first see Mary Margaret, she is under Regina’s curse. It leaves her as a ‘stereotypical spinster’ with dowdy outfits and buttoned up shirts with sweaters. Only after the curse is broken do we begin to see more of Mary Margaret’s personality in her wardrobe. It’s subtle but still there with more lightness to her outfits which is reflective of Snow’s optimism. Regina as recently as last week has moved in the ways of her wardrobe as well going from sophisticated suits and business attire to more casual outfits that we saw her wear at Granny’s with Henry. And of course we saw it done with no subtlety when Belle had lost her memory. It’s about layers and evolving. Wardrobe in a show is an extension of the story just like the score is. It is an indicator to the temperament of where the action is. While much will be made of Hook making a deal with Rumple for his hand the more important aspect to his changed appearance is that after 2 seasons Hook is finally in modern day clothing. Never having assimilated to his surroundings it is equally meaningful that a guy 300 years into life makes the conscious decision to change. To meet Emma where she is and the world she is from. Sure the guyliner remains in full effect and I adore that his rings remain in tact. But that is simply a credit to his retaining the qualities and aspects of who he is and who Emma fell for in the first place. Wanting to present himself as a suitor for the modern world speaks immensely about Killian looking towards the future beyond the adventures and peril that to date have drawn them together. I think it the clothes are an extension of how these two characters are willing to take a leap towards ‘normalcy’ in a world that has presented them anything but that. As to Emma in pink. Soft isn’t weak anymore than black is hard. The key is the relaxed nature that her transformation gives off. Yes it is about her willingness to be vulnerable, but it also speaks to her attempts to move towards fun and normalcy. When the chaos stops, what can this couple look like? Clothing is an extension of not only who we are, but where we are – in our lives and in the moment. I remember the difference we saw on Castle in Kate’s wardrobe in To Live and Die in LA. She wasn’t a cop, she was a friend looking for answers. As a result we saw Kate’s wardrobe from outside of the precinct which has lighter tones and a fluidness to them. Or even moreso the addition of jewelry being worn outwardly versus close to her chest (literally) first with the bracelet Castle buys her to of course now wearing her engagement ring openly since putting away her mother’s. It is an extension of her ability to wear her happiness out in the open rather than guard and protect it. Similarly, Emma shedding the tokens that remind her of Neal and Graham speak not only to her desire to move on, but her willingness to hope. When we hold onto what we’ve lost, we eliminate the possibility for making space for something new. Emma establishing a new look is about a willingness to approach something new with energy and joy. Everything about this outfit exudes joy and that is color that I think Emma wears even better than red. And I thought I loved costume analysis. 😉 In all seriousness, I could read your thoughts on the symbolism inherent in costume choices forever, and you did your friend proud with your beautiful defense of why costumes matter. I’m so happy you brought up the ponytail because I wanted a reason to talk more about it. 😉 A high ponytail leaves you with nowhere to hide. Your whole face, your neck, your shoulders—they’re all exposed. It’s just another extension of Emma’s openness. I also really loved your take on Hook making such a huge decision to put away the clothing he’s worn for 300 years and meet Emma on her terms. It is a sign of him looking at a real future and sense of place with her while still keeping himself recognizable as the man she fell for. For both characters, this date is about the hope that they can move on from the pain in their pasts and start fresh together. Katie, first off, I can’t thank you enough for writing this. One, because I have been thinking about it non stop since the preview and promo photos and I don’t think I could have made it till Monday without going crazy. But more importantly, we all know drama is coming (TV is a cruel mistress), and this happy moment is likely short lived. But it is such a huge happy moment for these characters, I believe 100% that this is a moment worthy of being celebrated, analyzed, and appreciated outside of the context of the rest of the episode. So again, thank you for providing us this forum. You did a great job hitting all the major points I would have thought to bring up about this moment, so I will focus a little on Hook’s clothing journey before I hit you with my intense date emotions. You know I have always defended Hook’s clothing up to this point (ok except maybe wanting to see more of the red vest). I thought it was an important symbol that he kept his pirate clothing throughout 3B. One, it was a visual representation of Hook not being a part of the curse. I love that there is no Storybrooke version of Hook, he has always been himself throughout his entire run on the show. A touchstone to the Enchanted Forest if you will. I also think its a great visual representation of how out of place he is in the town. He has never called Storybrooke home, because he has never had a reason to. That is of course, until now. Even in the first few episodes of Season 4, it felt right that he keep his clothes. He had not yet made that final commitment to stay, because Emma had not yet made that commitment to him that she was in this with him. But with Emma’s revelation that she is terrified of losing him because of what he means to her at the end of ‘Rocky Road’, its time for Hook to start the transition of becoming a part of the town, which includes the wardrobe change. Now is actually the only time that a costume change for Hook makes any amount of narrative sense. But on to the date. I love that for one night, these two very scarred people get to turn back time. As you so perfectly said, “There is a sense of innocence to this moment…in her pink dress with her hair off her face and her light makeup, she is the living embodiment of the idea of a fresh start”. I love that both Emma and Hook get to go back and channel their younger selves, before all the pain. I think this is the perfect symbol of what the two of them inspire in each other. The idea that even though they have suffered and closed themselves off and convinced themselves this was something they would never have again, they now believe that it is a possibility. Sure, they aren’t really those innocent teenagers, but the fact that they might be able to entertain the “what if” for a few hours, while filling in a few of their mutual missed life experiences in the process, is so beautiful I have been tearing up all week just thinking about it. This moment has been both their lifetimes in the making, and it couldn’t feel more earned. I also love that its not just an earned moment for Hook an Emma, its a huge moment for David and Snow as well. All those little moments they missed with Emma growing up, and they actually get a chance to reclaim one of them. I cant wait to see this, and even all the drama around it, unfold this Sunday. I have no doubt the rest of the episode provides us with as much great material to analyze as the photos did! Really love your comments on Hook. I always felt him staying in pirate garb was a way of saying “what you see is what you get” that this is who he is. And for Emma who is so used to people lying and not being who they say they are I always thought it was important that Hook was showing her who he was from the moment she bested him. Hook wore his pirate garb and reputation as his own armor to protect himself just like Emma. It’s really beautiful that both are willing to be vulnerable & to try and reclaim some of the innocence they had before being hurt. Thanks Mary. I love that you brought up Hook being honest with Emma about who he is. As you hinted at, this is the direct opposite of Neal, who even admitted had he known she was from the EF he would have never gone near her in fear of her discovering his EF persona. There is of course one obvious exception to Hook’s honest appearance, and that is when Emma and Hook first meet (I am ignoring the glamour spell since they were disgused together). I don’t think it’s meaningless that the one and only time Hook was disguised she saw right through him. I think he knew immediately that trying to be anyone other than himself was a lost cause. I’ve always thought that Emma seeing right through him when they first met set the tone for their entire relationship. Hook is honest with Emma (except for the lip curse thing but he had his reasons) and he makes Emma be honest not only with him but with herself. That’s why I’ve always liked the way he is willing to confront her when she’s trying to run. And I appreciate that even though Hook changed clothes that he is still not trying to be anyone other than himself. It would have been easy to just dress like David or Robin or even Gold, but Hook kept the leather, the rings and the guyliner – his new wardrobe is just a modernized version of his old. He’s still a pirate – just a 21st century one. It’s moments like this that NGN was created for—moments that bring out our most enthusiastic sides, moments that we can’t stop thinking about, moments that fill us with so many emotions that we have to talk about them before we even see the episode they’re in. I wrote this because I feel the same way as you; there will be plenty of drama ahead, but I want to take as much time as possible to celebrate this happy moment. Your take on Hook’s costume change is so perfect. I’m another one who really liked that he kept his pirate clothes for so long. Like Mary said in response to your comment, I always saw it as a way of symbolizing that (after Emma discovered he was lying as soon as they met) he was nothing but himself with her. It was a nice contrast to the other men Emma was with, who hid their true identities from her (or didn’t know their true identities, in Graham’s case). Your point about him being afraid to put down roots until he knew what he meant to Emma is also really important. Emma’s costume change is a direct result of what happened in “Rocky Road,” and so is Hook’s. He finally knows how much he means to the woman he loves; he knows he’s someone she can’t lose. Having that confidence allows him to hope that he can now be a permanent part of her life, so he’s going to start dressing in a way that fits with the world he’s becoming a part of. He’s losing his armor, too, and it’s such a beautiful thing to see. Thank you very much! I’m happy that this could help remind you to focus on all of the things to love about this show and its characters. It’s easy to end up getting stressed by fandom drama (it happens to me too), but it’s important to remember that no amount of negativity or bitterness can take away from the inspiration so many of us find in this show. I love the way this turned out, especially the focus on Emma’s conscious choice to be vulnerable around Hook. You see it in her clothes, as you and your lovely commenters have pointed out and you also see it in the people she chose to surround herself with. Emma is not only showing her vulnerability in her willingness to let Hook see her truest self but she’s also showing it to her parents and Elsa. I totally accept that I’m projecting like crazy on Emma at the moment, but it’s hard to let others in on such a happy moment. Emma has such a bright smile on her face when she sees Hook and other people are there to witness it. There are now 3 other people who know how much Emma cares about Hook and the person she is when she’s with him. It just feels different being around a person you care for so much when it’s only the two of you than it does when you have an audience, no matter how much you may love the members of that audience. You have to be willing to let that audience in on your thoughts and feelings and even though Emma’s feelings for Hook have already been made clear to the Charmings and Elsa, this is the first time they’ve really been on display without an external crisis. Emma is fully aware that she is being watched and she still chooses that beautiful smile and to show those slight nerves when she walks out in her dress for the first time. She looks like a teenager going on a big date with someone she really likes. She’d not jaded by her past, she’s letting that hope for a happy ending with Hook in and she’s sharing that hope with (most) of the people closest to her. This is so beautiful, Heather, and so true. It takes so much courage to show other people how much you care about someone. It’s a whole different kind of vulnerability, and it’s a huge step for Emma, who we know to be generally very private when it comes to her emotions, even around her family. I love that this moment seems to be about Emma and her family in addition to Emma and Hook because we all know I’m a sucker for a great “Charming Family” moment. Thank you so much for writing this. I’ve been thinking a lot about Emma and Hook’s outfits since the promo on Sunday. And I’m so glad I don’t have to wait until next week to talk about them. I totally agree that both are trying to recapture a little bit of their lost youth with this date, for both of them its a second chance to experience something that neither one of them got to do in the first place. I love that you brought up the two dates we have seen Emma on because I was reminded of both when the dialogue tease came out earlier in the week. Emma says she knows how to plan a date – but how many of those dates were setups to catch a bail jumper? And we know that Walsh planned the date they went on and was the one who initially asked her out. And Hook’s response that she knows how to chase monsters fits rather well when you consider her current job and her former profession. I love that from the promo Emma asks Hook out, once again taking the lead, but that the dialogue indicates Hook tells her he’ll plan it. We haven’t seen the whole scene yet, but if Emma does let him plan it I think it is a nice symbolism that they are a partnership. It’s her idea, but she doesn’t have to do all the work, he’d like to do this for her because he is in this with her. Also you pointed out that Emma’s dress is ladylike and I think that goes with the Lady and the Tramp spoiler that was dropped today. It may not be about Hook and Emma, but the parallel is there with the princess and the pirate. Finally, as excited as I am for this date I’m even more excited for David and Mary Margaret’s reaction. I love that they wait up for her and that they are getting the chance to be here for this moment since not only did they miss this chance when Emma was younger but so did she. 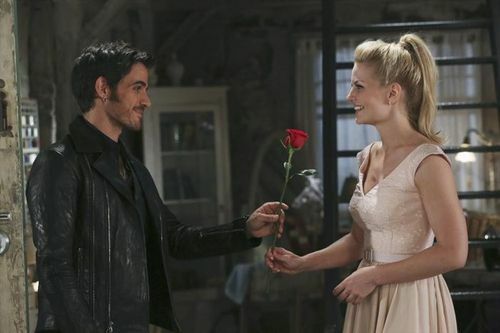 It’s not just Emma and Hooks’ first date, but its a lot of different firsts for Emma, Hook, and the Charmings. I’m also glad I’m not the only one waiting with bated breath to see how Emma’s parents react to all of this. If the spoilers picture had me feeling so many emotions, I can’t even imagine what I’ll be like when I see it all play out on Sunday! Awesome insight. Love it and can’t wait for Sunday!